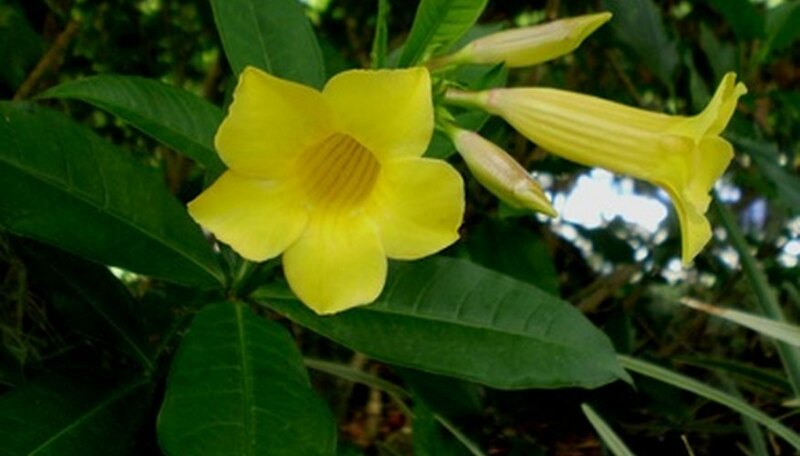 Mandeville, also called mandevilla, is a tropical vine with large flowers that has become popular with gardeners in USDA zones 9 to 11. In zone 8, mandeville vine may die back from frost but will re-emerge and grow the following spring. Mandeville vines have fragrant flowers growing in clusters that bloom heavily during the summer but sporadically over the winter. A fast-growing vine, the mandeville is often used as screening. Plant your mandeville vine in a sunny to partial shade location with well-draining, rich loamy soil. Mandeville will flower best in full sun but in hot climates needs midday shade. If temperatures fall below 65 degrees F, your mandeville will slow its production of flowers. Check the soil moisture every few days. Mandevilles love well-draining soil, are sensitive to overwatering and need to have the soil dry out between watering. Water your mandeville vine slowly to ensure that the soil becomes evenly saturated. Fertilize your mandeville vine every two weeks during the blooming season of summer, using an all-purpose fertilizer. Producing flowers takes a lot of energy from a plant, so feeding your mandeville will promote the continuation of bud and flower formation.